Just across the Rosario Strait from the San Juan Islands National Monument, MilitaryByOwner invites you to browse the stellar Pacific Northwest homes for sale. From waterfront views to mountain vistas, Washington State is brimming with natural beauty! Located North of Seattle, these homes offer the option to commute to Naval Air Station Whidbey Island, Naval Station Everett or Coast Guard Station Bellingham. After a long day at work, you may need a little down time. 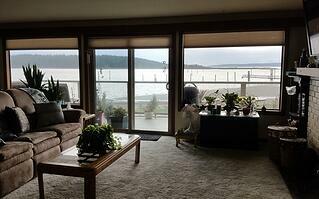 Imagine yourself relaxing on a spacious deck overlooking the water of Oak Harbor, Washington. This 2 bedroom, 2 bath condo is part of a friendly 4 unit building. Savor waterfront luxury with a large master bedroom suite, including a walk-in closet and Jacuzzi tub. Invite friends and family to soak up the sun and sand at nearby Oak Harbor Beach Park. Then, gather your guests around the fireplace of this welcoming abode. Located in Oak Harbor of the Saratoga Passage of Skagit Bay, this property is a short commute to NAS Whidbey Island. Enjoy the ease of waterfront living with this harbor home! The city of Anacortes, Washington is nestled within the Olympic Mountain rain shadow. This means it receives half as much rain as the city of Seattle. 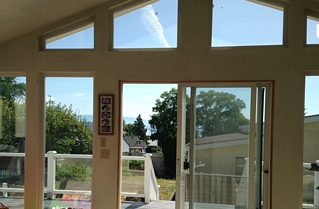 Having more Pacific Northwest sunshine means more time may be spent out on the large deck or inside the spacious sunroom, while admiring mountain and water views. With 2 bedrooms and 2 baths, this home also offers a lower-level bonus area. Complete with a kitchenette, bath, and abundant storage, this added square footage might be transformed into a family room, man cave, arts and crafts area or potential apartment rental. The property also includes a generous garage with enough space for an RV. Traveling south down Route 20 brings you to NAS Whidbey Island, with additional routes to CG Station Bellingham and NS Everett. 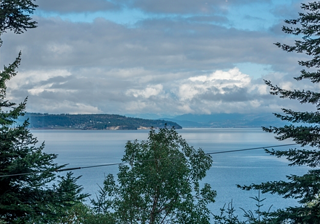 Make the most of living in Anacortes with this versatile property! Springtime in Mount Vernon, Washington brings the Skagit Valley Tulip Festival! 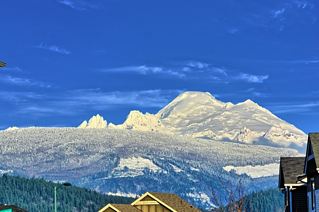 Follow the colorful blooms down Skagit Highlands Parkway to this 4 bedroom, 2.5 bath home. With premium updates to the lighting, counters, and flooring, it is easy to see why this home welcomes family and friends to gather. Complete with an office or den and an upper level loft, this abode offers spacious square footage. Ideal for a busy military family, nearby trails lead to local parks and community amenities. Additionally, NAS Whidbey Island, CG Station Bellingham, and NS Everett may be reached via routes like I-5. With stellar mountain views, this inland gem may be the perfect fit for you and yours! Feeling stressed out at work? This is your chance to get away from it all! Float your cares away on the tranquil waters of Penn Cove near Long Point of Coupeville, Washington. The unique architecture of this 3 bedroom, 1.5 bath cottage offers ample amounts of natural light. The generous windows showcase postcard views of peaceful water and serene woods. Tend to flower and garden beds with terraced landscaping. Survey your sprouts from the lengthy deck. Make s’mores and memories around the fire pit. With Route 525 South you’ll reach NAS Whidbey Island, and CG Station Bellingham and NS Everett are also in the area. May you find your happy place with this getaway home! *Note: These properties are no longer listed, but if you anticipate orders to a military installation North of Seattle, look to MilitaryByOwner to help launch the search for your future home, including easy access to homes listed for sale or rent on our updated iPhone app. Listings such as these are a small sampling of the wide variety of Pacific Northwest homes to choose from. Additionally, it may be helpful to browse online reviews of neighborhoods near NAS Whidbey Island, CG Station Bellingham, and NS Everett on Military Town Advisor. From waterfront walks to trekking along trails, the Pacific Northwest offers ample opportunity to experience and explore nature’s beauty. May you find a home along the route that is just what you’ve been looking for!